The translator is enabled by default in Yandex Browser. 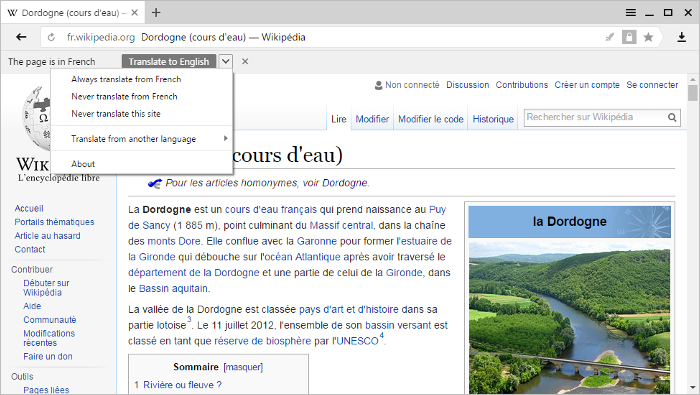 If you open a webpage in a foreign language, the browser offers to translate it into your browser interface language. You can also translate individual words or sentences without looking them up in a dictionary. What should I do if the translator isn't working? 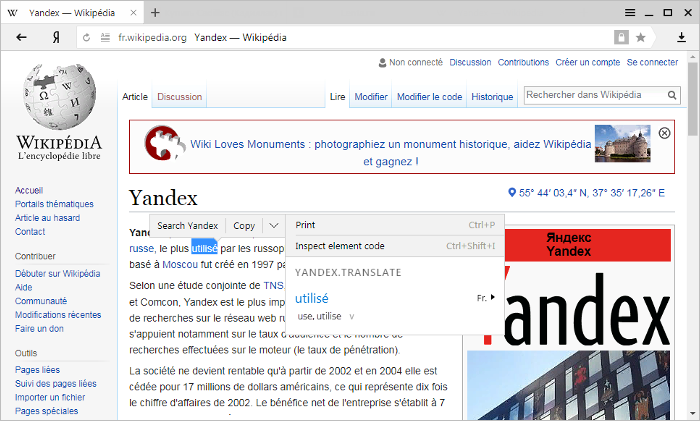 Yandex Browser automatically detects the language of the loaded page. If it differs from the interface language, the browser asks if you want to translate it. You can also open the translation window by clicking the icon in the right half of the SmartBox. To translate the page text to the browser interface language, click the Translate button in the window. To display the page text in the original language, click Show original in the window. 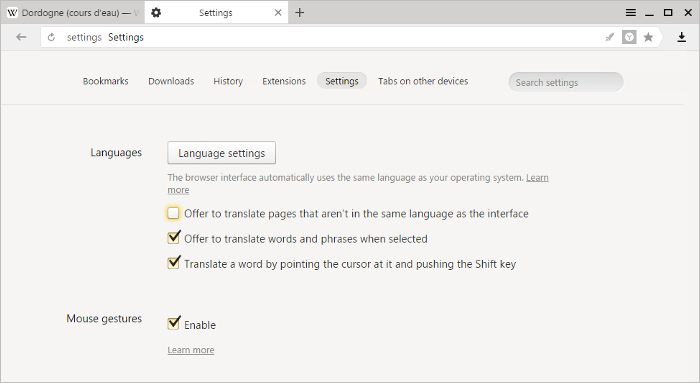 If you want to translate a page into another language, choose the language manually by clicking Translate page into a different language in the window. Open any page in the language that you don't want the browser to translate. Click → → Never translate from. Open any page in the language you want to re-enable translation for. Turn off the → → Never translate from option. If the language you want is not in the list, click Add. In the drop-down list, select the language and click OK. The language will appear in the browser's list of languages. Make sure that the Offer to translate pages in this language option is not selected for that language. In the Languages section, click Language settings. Choose the appropriate language and select the Offer to translate pages in this language option. Open any page in the language you wish to enable translation for by default. Click Translate in the window that opens. Click → → Always translate from <...>. The Always translate from <...> option is also available from the window that opens when you click Translate page into a different language. Yandex Browser can translate separate words or sentences on a page into your language. To see the translation of a word or phrase, select it on the page. In the Languages section, the Offer to translate pages that aren't in the same language as the interface and Offer to translate words and phrases when selected options should be selected. In the context menu, select Translate to English. The browser checks spelling in text entry forms (for example, when you're writing an email). On the right side of the language list, select the Check spelling in this language option. Under the list of languages, select the Enable spell checking option. Attention. If you enable a personal dictionary, the built-in dictionary will not be used for spell checking. Make sure that the Enable spell checking option below the language list is selected. Click Custom spell check dictionary. In the Add word field, enter your word. In the Add language window, select the language and click OK. 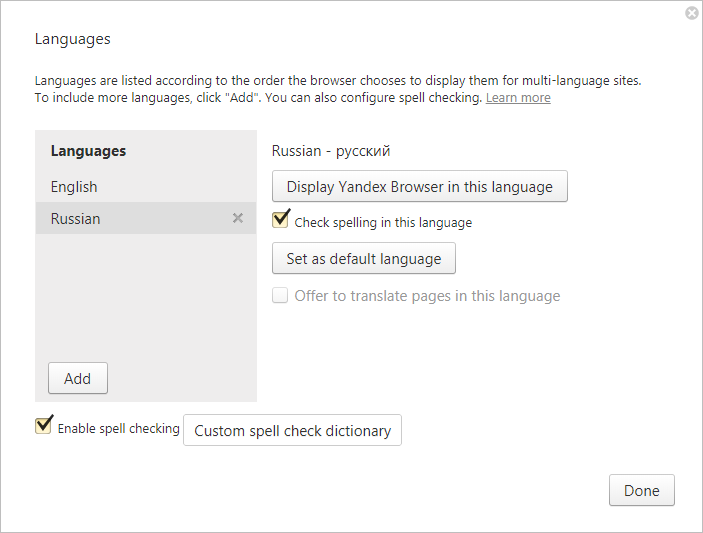 In the list of available languages, select a language and click Display Yandex Browser in this language. Note. If you want webpages to display in a language other than the interface language, click Set as default language.